Article originally appears in the Summer 2018 issue of the Hoosier Surveyor. The old traveling surveyor doesn’t get to travel quite like he used to. These days I am stuck behind a computer looking a point clouds all day—and by the time lunch rolls around I need a break and see the sun, even if it is just during the drive to get a quick bite. In September I found myself stuck in Indy and going a little stir-crazy, so when presented a chance to deliver some data on a hard drive to my client and friend Andrew McClelland, I was quick to suggest it be a lunch meeting. Given the location of our two offices, downtown Indianapolis was an obvious choice, but what was not obvious was where to go (toughest decision of the day). After several email exchanges of “I don’t care, where do you want to go?” I stepped up and suggested a little off-the-beaten-path place…John’s Famous Stew (1146 Kentucky Ave., Indianapolis). Now, John’s Famous Stew is no hipster place down on Mass Ave—it is quite the opposite. This place doesn’t even have a website, and you can bet they don’t have Wi-Fi. No, John’s is very much a throwback to a simpler time when a man needed a hearty stew and a cold PBR after a hard day’s work in the factory. So, John’s has been a local institution for more than 100 years. I am sorry that I am just now discovering this place—but if eating this fine stew helps me live to 99 like Mother Dapa, then I have a lot of stew eatin’ years ahead of me. Walking into John’s is kind of like stepping into a time machine and going back to the 1950s. The outside of John’s has no windows, so you are not sure what you are getting into, but you walk on in and seat yourself. I hear that the place can be quite busy, but I typically eat around 11:30 a.m. so it has never been bad when I have been around that time. The décor is kind of typical dive bar with the neon signs and mirrors advertising a brand of beer, but I particularly like the very large racehorse mural covering the entire wall by the front door. There is a small “ticket window” that led us to speculate that maybe the place had been some kind of theater at one point, but after a quick question to one of the wait staff we found out that check cashing was done there at one point. That kind of sets the tone for the type of place this is. The waitresses have mostly all been working at John’s Famous Stew for more than 20 years. As with most who have worked at their jobs for that long, these ladies are quick-witted and have a little Seinfeld Soup Nazi attitude. This was off-putting to me at first but after a couple of visits this attitude has come to have its own charm. After some light hearty chat with Andrew about workload—and with the waitress standing there tapping her foot with an “order already” look on her face—we figured we had better make a snap decision. Andrew went with the Cabbage Roll Stew and since I had already had the “Famous” stew on previous visits I decided to go with John’s Famous Tenderloin. Fresh from the kitchen at John’s Famous Stew are bowls of (clockwise, from top left) Cabbage Roll Stew for Andrew McClelland; a mild version of John’s Famous Stew for Nick Jamieson; and a mix of mild and hot stew on John’s Famous Tenderloin for Ryan Swingley. The famous tenderloin is a breaded pork tenderloin covered in the famous stew but with no bun. You are given the choice of mild, medium or hot version of the stew. Typically, I like hot stuff but the hot here is a bit too much for me to enjoy the flavors of the stew. I was given the option of a mix of mild and hot that is a bit hotter than medium, so I went with that. My new employee Nick Jamieson went with the Mild Famous Stew. The menu is not limited to stew, and there is a large selection of your typical bar fare, but “stew” is in the name of the place, so you got to get a stew. Our food came out pretty quickly and as you could imagine the table chatter went silent. Time to dig in! The stew atop my tenderloin consisted of large chunks of beef, peppers, onions, carrots and celery, all swimming in a thick broth with a rich beef favor and light undertones of paprika and just the slightest hint of sweetness. The stew was spot on. The tenderloin was a bit flatter than I prefer, which is kind of a nod to my childhood when tenderloins were the size of hubcaps. While it was good, next time I will forego the tenderloin to make more room for this outstanding stew. Andrew is a bit of a little fellow so the fact that he cleaned his plate should be a testament to how good the Cabbage Roll Stew was. Nick is a bacon cheeseburger guy just like his dad, Todd Jamieson, but he was glad he did not steer away from the stew this time. So, the next time you are in the area I suggest you give John’s a whirl. I mean, 107 years of loyal customers can’t be wrong. 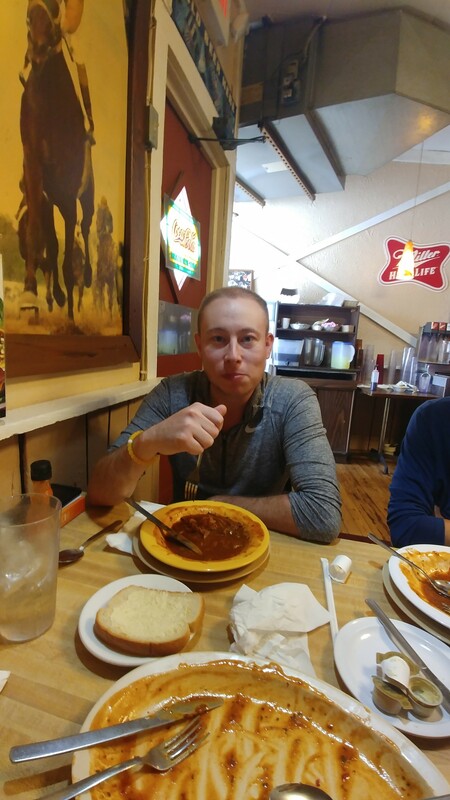 Caption: Andrew McClelland opted for the Cabbage Roll Stew at John’s Famous Stew. The well-scrubbed plate in the foreground belonged to Ryan Swingley and once was filled with an ample serving of John’s Famous Tenderloin.